Bulldog training may seem daunting when you first get that adorable puppy, that is why this guide will break down the process in simple and easy to follow steps. The secret to a well-behaved bulldog is to start with training as early as you adopt him. Early training helps the puppy better develop his brain and habits (potty training, leash training, socialization and more!). Bulldogs as pets are a great choice because they are a happy and relaxed breed. The bulldog originated in the British isles and its name was chosen because it was originally bred for a sport called “bull baiting”. This was a cruel sport that was, fortunately, banned almost 200 years ago. The breed retains its strength but has become a calm and amusing breed. Bulldogs have the bad reputation for being stubborn and strong-headed but don’t let that scare you. I have personally worked with many bulldogs and non of them were stubborn at all. The stubbornness of a dog comes from not understanding its owner. 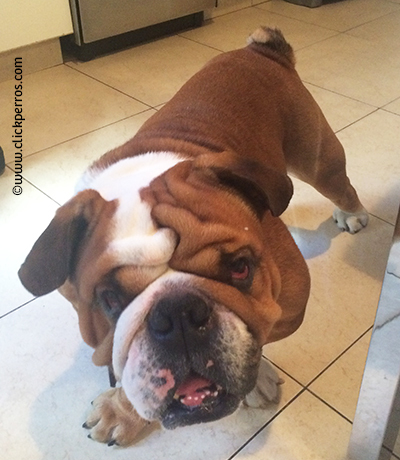 The training methods outlined below will help you communicate with your bulldog successfully! As you train, keep an eye for some common British bulldog health problems like respiratory problems, overheating and skin allergies. If you just got your bulldog puppy and are wondering what to do, just follow these steps and you’ll be on your way to a well-behaved furry best friend. 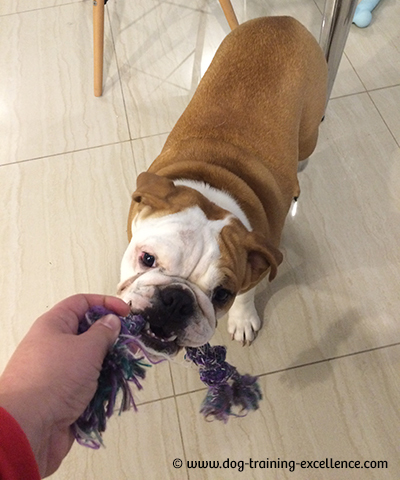 Bulldog training can be fun and easy! Socialization is the single most important exercise you need to do with your puppy and you have only a few months to work on it. It involves showing your puppy the world he will be living in and making positive associations with the things, animals and people in it. Take your puppy to your friends and family’s houses, take him for a car ride, pretend to clip his fingernails and brush him. Every single new event, person, animal, object or sound your puppy encounters should be followed by a treat. This will make every association positive and you puppy will learn no to be fearful of new things. 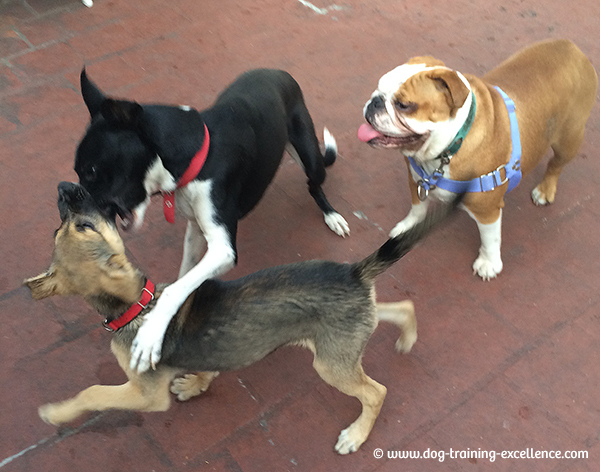 Learn more about socialization exercises for your bulldog puppy dog. Probably the second most important task is to teach your bulldog puppy to potty in one place or outside. Puppies are very smart and can learn simple things very easily. Potty training requires patience and perseverance. The main idea is to create a schedule or habit for your puppy to follow. A bulldog puppy can hold his bladder 1 hour for every month of life (tops! ), so if you have a 3 month old puppy you should take him to potty every 2-3 hours and give him a treat after he is done. If you can’t watch your puppy, you can crate-train him to avoid accidents. If he has accidents, simply clean them up with an enzymatic cleaner and move on, do not punish your bulldog. Learn more about potty training schedules and techniques to teach your bulldog to potty outside in as little as one week! To chew only his own toys. Crate training your bulldog puppy can also help prevent home destruction and teach your puppy that the only things available for biting are his own dog toys. Don’t get stuck with the idea that bulldogs are stubborn and can’t be trained. 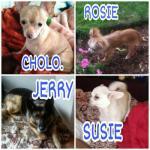 They are smart dogs that can learn as much as any other dog breed. 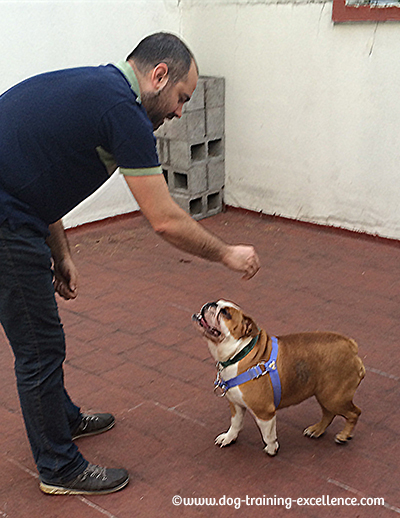 Follow these steps to teach your bulldog the basics of obedience training. 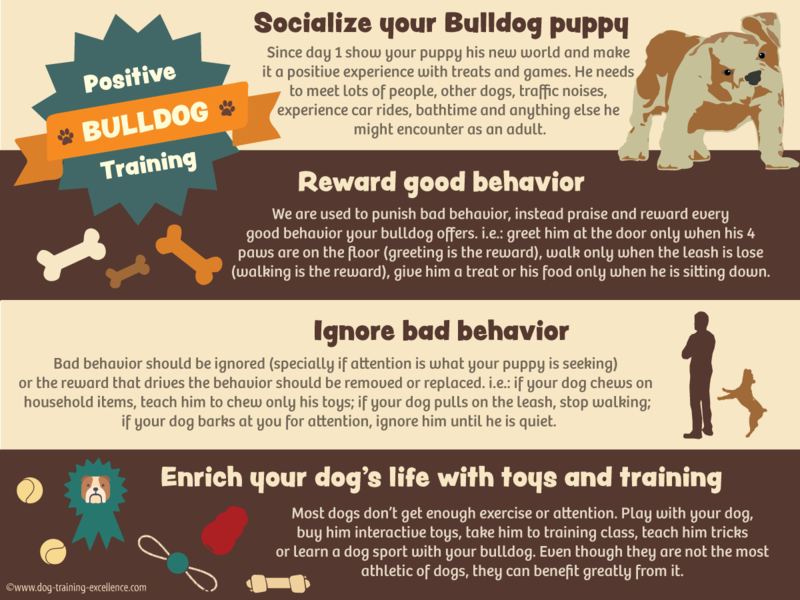 Positive bulldog training is about rewarding your dog for doing something right and ignoring your dog when he does something wrong. 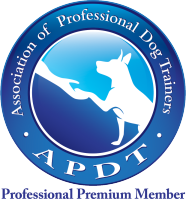 Positive training also involves actively teaching your pooch the things you would like him to do (instead of expecting him to know on his own). There are two training methods that are very useful to teach your furry friend obedience: luring and capturing. Dogs can only make associations withing the present moment. That is why punishing or rewarding a dog for something he did in the past does not work. 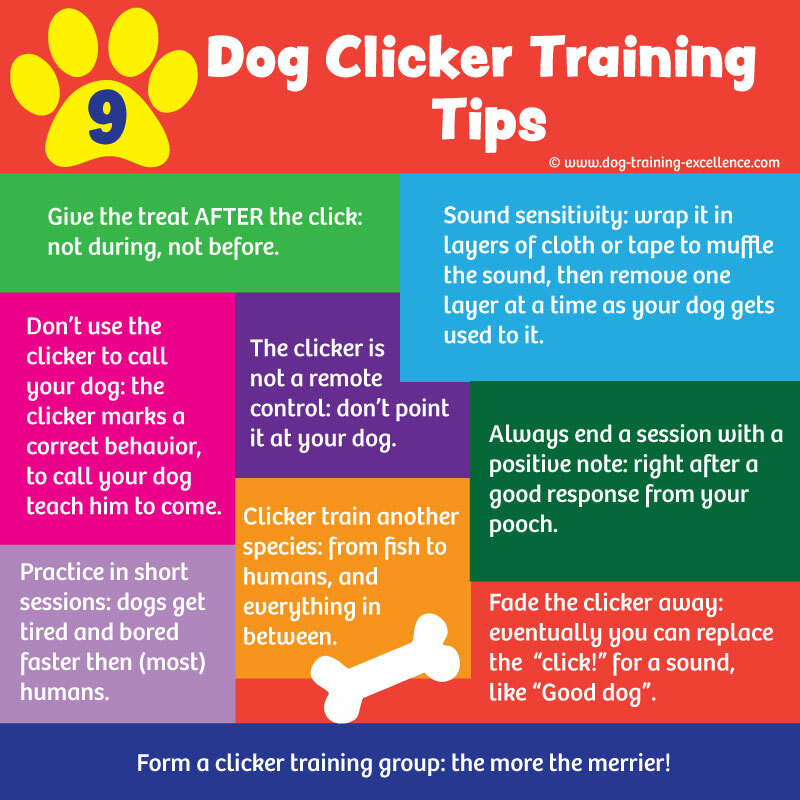 To help with timing, dog trainers use a marker word or a clicker. A marker word is used to mark the moment the animal did something correct and it is followed by a treat. The use of the word helps you have better timing, which in turn helps your bulldog understand what you are rewarding for faster. To teach your pooch the meaning of a marker word, all you need to do is say it and follow with the delivery of a treat. 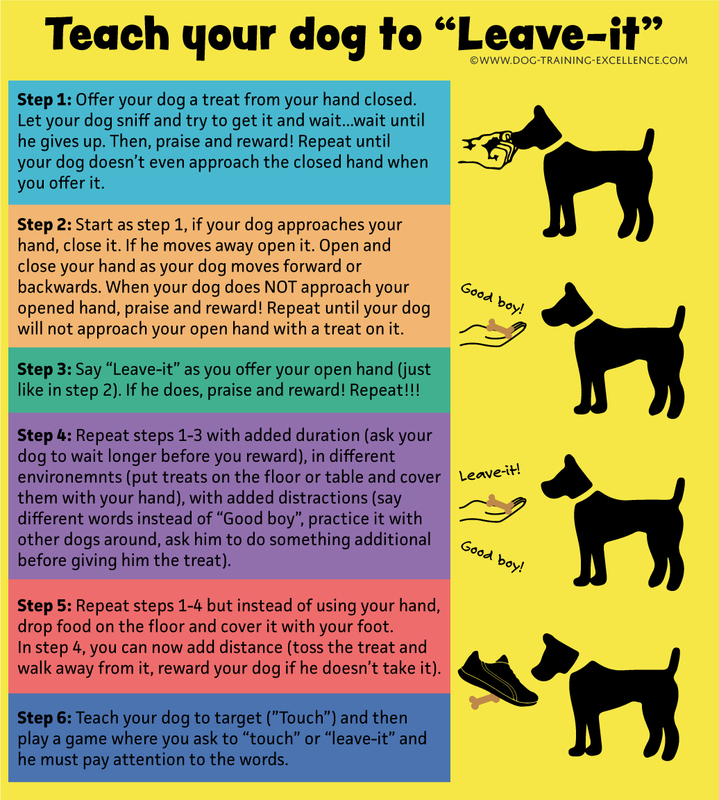 It's important that the treat comes AFTER the word, otherwise your pooch won't learn it. Practice 10-20 repetitions, 2 to 3 times a day and you will notice that your pooch will start responding when he hears that magic word! One of the most important things to teach your bulldog is its name. This is always neglected, you name your bulldog, then assume he will understand that is they way you call him. Unfortunately, this is not true and recognizing its name is one of the most important things a dog should know. If your puppy doesn't look at you when you call him, how is he going to do what you ask? Immediately afterwards, give him a treat! Repeat many times and in different places and situations. Enjoy your bulldog puppy and train him to become the best companion dog! While you work with your pooch, you can also keep an eye for common bulldog health problems such as respiratory problems, skin allergies and eczema. Loving positive training? Learn how to use a clicker!